laces, ribbons or whatever comes to mind! Maybe even your secret dreams! Isn't this such a pretty old piece of cut lace linen? a journal page about a year ago. pieces into a crazy patchwork effect. - a tag to adorn this dear little image with! as the Autumn leaves rapidly fall and get blown away. I'm linking this post to Blissful Whites Wednesday! so go and check out this beautiful blog! A pretty white post Suzy.Pretty laces, and nice bag. I found some today too.A big box just arrived in at the Salvos store where my friend is the manager. I also found some nice textured yarns, and a print of Van Gogh's sunflowers for Mum's wall at the Home.She loves Van Gogh's sunflower pics.I'll change her quilt to match when we are there on Mother's Day. So very, very pretty Suzy! Still loving those vintage colours/shades and was thinking myself that those brown and black buttons add a gloriously vintage touch to the whole piece. The graphic on the tag is just adorable. I love this new bag! I found recently many laces where I'm on hollydays! I want to make another bag for my knittings, where I'll use them! 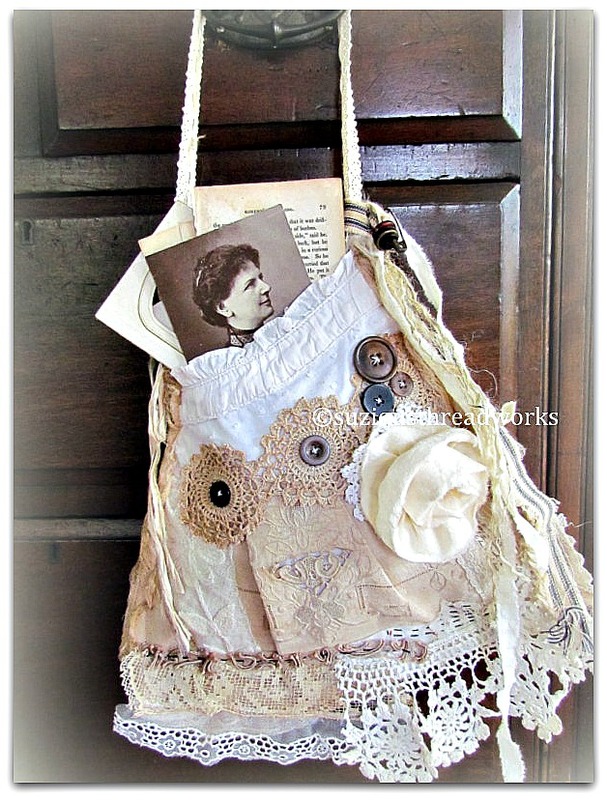 Such a beautiful bag and tag Suzi! Love the addition of buttons and that rusty pin, the perfect vintage touches. Have a wonderful day. 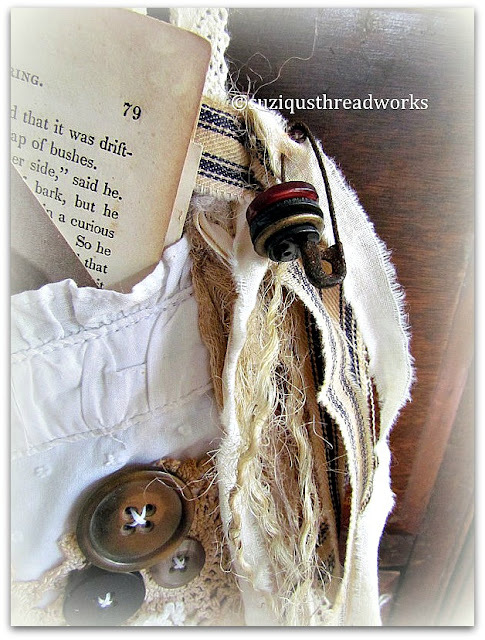 What a lovely way to use up your laces & vintage fabrics. You must have such a lovely garden! Never was there such a beautiful bag. Just imagine taking this bag on your next shopping trip. People would be stopping you to examine it. You would never get through the store. Thanks for posting. Suzy ... FABULOUS work. Thank you so much for sharing! Beautiful Suzy. I love this sweet little bag. You did a brilliant job piecing it together. And all your embellishments look totally amazing on it! The tag too, is just so very dear! I love it! Your last of summer roses are very pretty. A few days ago my first rose bloomed! Den sødeste posetaske jeg længe har set, min første tanke var: har jeg ikke en gammel hvid bommulds bluse? men, men det er jo ikke gjort med en gammel bluse, tusind tak for kikket. knus morkaren. Oh my gosh Miss Suzie your linen and lace bag is simply to die for gorgeous!!! You sure did a beautiful job with this sweet little bag,love the old pic in it! Absolutely precious! The safety pin adds to the authenticity of the look and brings such a nostalgic feel as does the old picture and that lace is amazing. Wow. Oh my.... I was in the mood for some eye candy and decided to check out my favorite Blogs and what do I find? Your beautiful bad - so delicate and oh so pretty. Spring has just arrived here in MA and the flowers are just starting to bloom. Looking forward to seeing some beautiful roses in a few weeks. Enjoy your winter - I know you've be creating up a storm. Such a beautiful post showing how white is so wonderful to work with and showcase your treasures...as always this has lots of inspiration going on...just lovely. what a beautiful idea! I enjoyed much all photos. Everything is so lovely! Your bag is amazingly beautiful, my dearest Suzy! 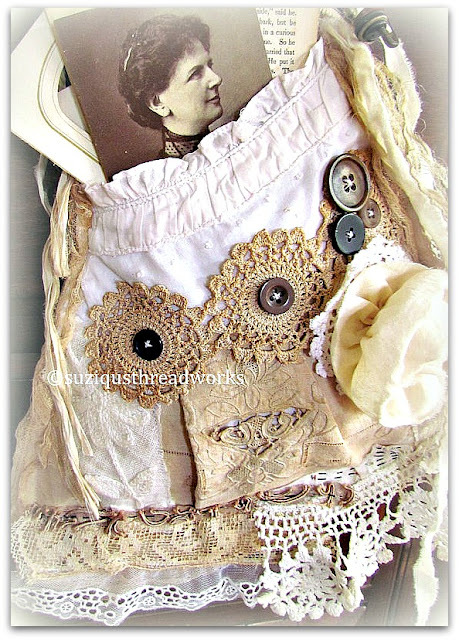 Oh I love it -love the beautiful old fabric and lace pieces you have used on it and the dark buttons just kind of "frame" the soft lovely laces in white and creame,- so lovely my sweet friend also with the buttons on the pin! !- and that tag ! !what can I say ! !only BEAUTIFUL !!!!! Both so romantic and lovely- like little special dreams ! 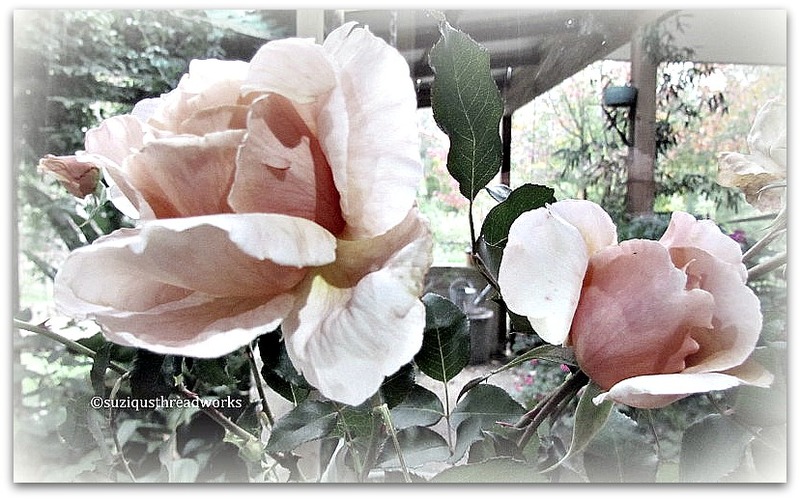 I`m happy you have been creating these beauties- and hope you just now are sleeping relaxed and good, my lovely friend! I am a lover of pink roses ,so thankyou for telling me what they represents! Your "Just Joey" are gorgeous!! The back is just as gorgeous as the front of this beautiful bag. So pretty and practical. J'adore. Hello dearest Suzy, That bag is so adorable and for sure an eye-catcher with all the pretty laces and embellishments. It will draw attention when you take it out. Hopefully Andrea is doing well, according to the cicumstances. I've been thinking of you and her every day. I'll email you next week. 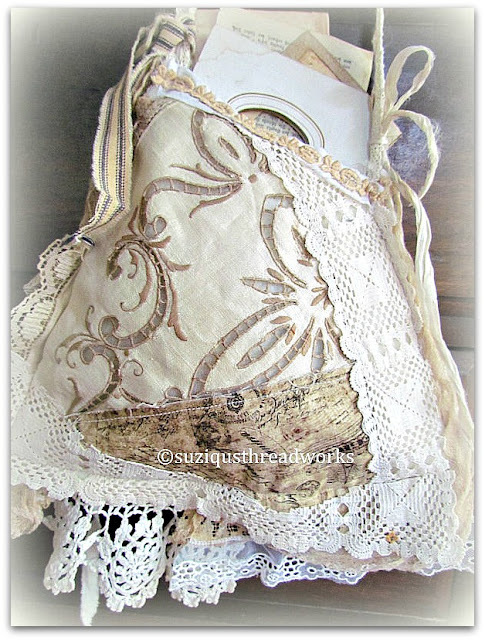 Dear Suzy - how beautiful - I love when things can be used and just love bags (crazy me...) and this bag is just wonderful!!! Such a beautiful bag you've created! I love all the details you've added-the rusty pin with buttons and the snippets of lace. Your roses are beautiful! Ohhh. Gorgeous Suzy. Love everything about it. The lace, flower, fabric sooooo beautiful. Another one of your stunning creations! You are so blessed with creativity! I know you are about to enter Autumn but I hope your winter doesn't last as long as ours did here in the U.K! Suzy dear-- well, of course it's beautiful!!! If you made it-- then it will be gorgeous! 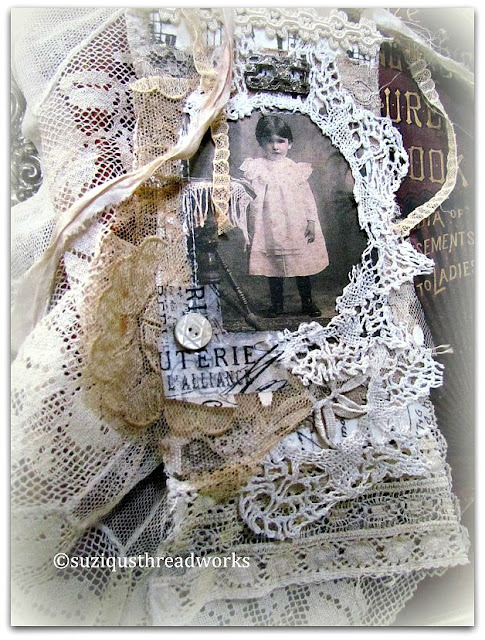 Such a unique combination of vintage laces and treasures-- can I just say that I love the rusty safety pin!!! Dear Suzy, I am impressed and inspired by the beautiful things you make. Congratulations! It's adorable Suzy! What you can do with leftovers is truly amazing - very shabby chic. I love the addition of the black pin with buttons on it, just the right amount edginess to foil the lace. Gorgeous. Be still my heart!! So beautiful, Suzy! 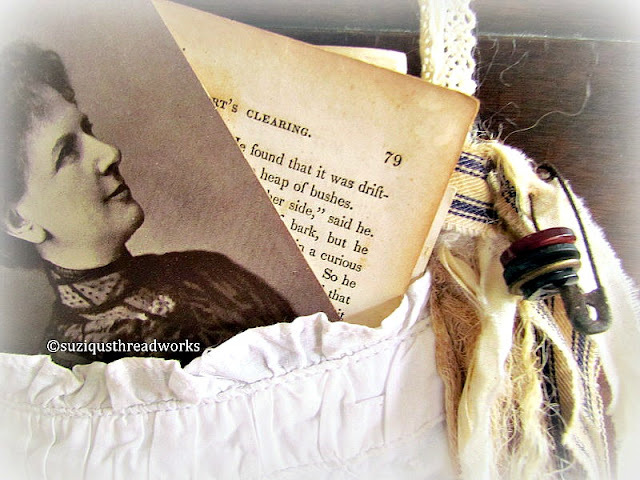 What is it about vintage, tea stained items that just make the heart sing? You are an artist extraordinaire at interpreting these vintage treasures. Your bag is so beautiful!! You've combined a lovely array of fabrics, colors and items for a really exquisite piece. I love everything about it. Everything you make is so beautiful, and so uniquely you. This bag is no exception. It is totally adorable and a wonderful thing to keep precious little treasures in. Roses, aaahh, yours are so delightful. I will still have to wait a couple more weeks before ours here at the cottage will start blooming. As usual I just love your bags, so creative and talented!! You really enjoyed making this gorgeous bag - I can tell! I love the old linens and that cut lace piece is what I dream about! The old brown and black buttons add an authentic touch of vintage. Your muse is in sync once more! I couldn't visit blogs while working this week so I'm catching up this morning before being taken out for Mothers Day brunch by my darling son! Oh Suzy: You bring such beauty to the plainest of things! A true Artist! Such a gorgeous bag and tag,dear Suzy.Love the way you phographed it.Have a wonderful start of the week sweet friend. Suzie,I'm so sorry to hear of your friend's problems. I hope she remains comforted and pain/anguish free for the duration. And oh my goodness dear, both your bag and tag are most gorgeous and wow. I love the use of leftovers, especially when it's lace and fabric. You have created two masterpieces with them once more. And love the vintage and soft sweet look of them. Wouww thats very gorgeous. You are really the magic hands Suzy. The bag is so wonderful. 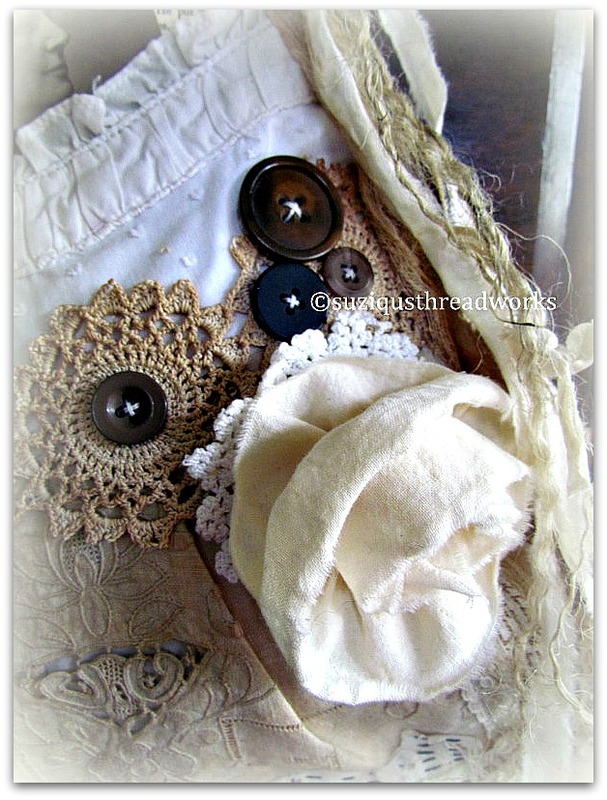 I do agree, brown and black buttons do go well together for the vintage look, some of my favorites. I specially love the rusty pin, adds a little bit of rustic in my mind. Thanks so much for sharing your wonderful piece of art. Oh this is so, so beautiful Suzy. This is truly amazing!!! I LOVE your newest bag. I am also in awe that you have such beautiful roses. I know you must be so happy about that :) Mine have just barely put on their leaves. I am getting so excited! Just caught up with your beautiful blog. 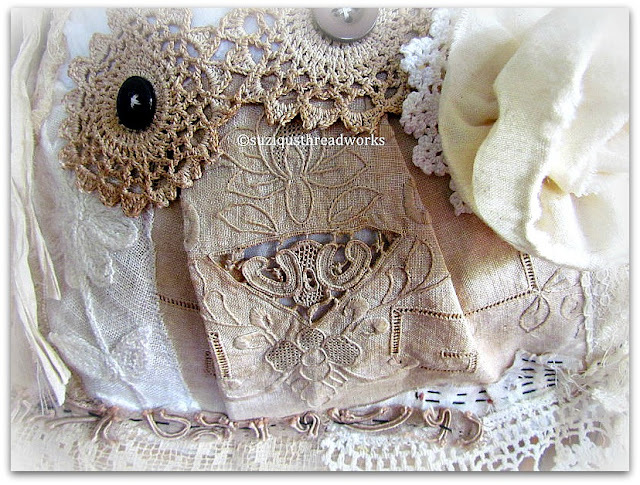 I love your lace & linen bag! What a great way to hold treasures. 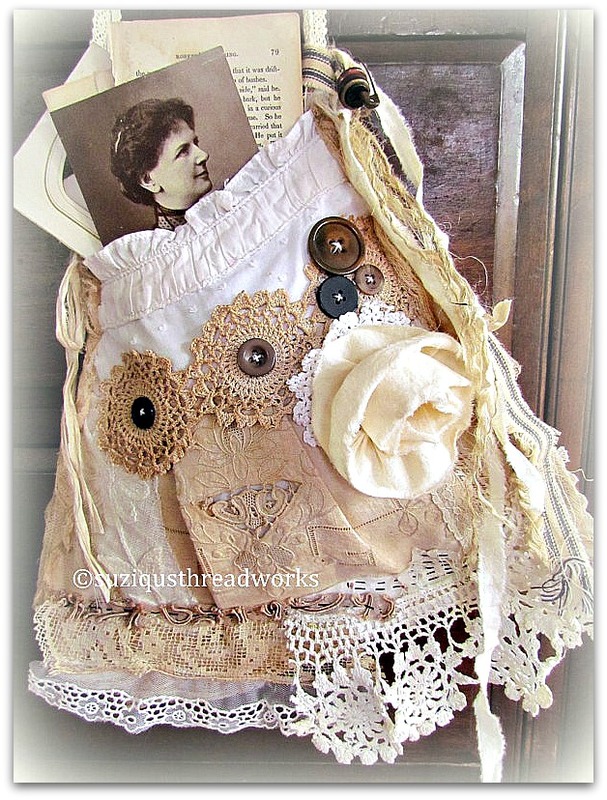 I did that with an old linen childs apron with pockets. I love pockets. That's for my daily dose of inspiration. As always my friend you create nothing less than beautiful. But I have to say the back of this bag! Oh my but it punched my swoon button hard! Our roses here in the mounntains are just beginning to open. We've had a very strange spring so it will be interesting to see what summer brings. Your creations are always so wonderful. And you photograph them so beautifully. Thank you for sharing. I finally finished the 2nd pink scarf and have them ready to send to Vicki. I even found a nice long one to send that will really comfort whoever receives it. I plan to take some photos today before sending it off. And, here's the big news: I was able to past the photo and link in my sidebar for the Pink Scarf Project. It went to well that I posted the button for your blog even though I already have you in my list of favorite blogs. I'm using Bloglovin to follow blogs as well as emails. Blogloving is so easy and wonderful. We just entering Spring in Flagstaff, AZ, USA. Nights are still cool and the days are filled with sunshine. Everything is coming back alive in my front yard and blooms should be appearing soon. Right now, I have lilac bushes spreading and growing. I haven't gotten any blooms because we usually have a heavy frost just about the time they bloom. But the green is gorgeous. Hope all is well in your part of the world. Happy Sunday. It has been too long dear Suzi!! I have been away from blogging for a bit and I have missed you! Your work inspires me so and I love seeing pictures of flowers form your Garden. I love Pink roses and have quite a few but I did not know what they stood for!! thank you for that! Might have to get a Just Joey bush and perhaps rename it after you!! Hugs!! LOVE your linen bag Suzy - it´s SO pretty. The details are perfect. and in my favorite color. Oh my goodness, I think I’m inlove. I’ve never seen anything as gorgeous, as vintage and as unique as this one. I would love to make that, too. But I’m not that good when it comes to designs and combinations. I really really adore this one. Hope you could make one for me. Just kidding!